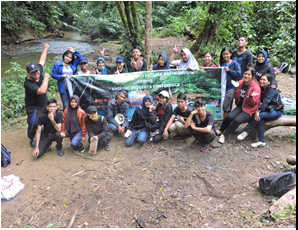 Basic Leadership Training, also known as LDK ESC, was once again held both in the university area and Berambai Waterfall from Friday to Sunday. The purpose of the Leadership Training Program is to hone the solidarity and characteristic of students to become better. It was the second Leadership Training Program to be held by ESC, in which less than 20 participants attended, personally assisted by senior members or ESC retirees. The program was held successfully. ESC itself is an association of English-Teaching Faculty students led by Malik Sofyan. The structure of the Leadership Training Committee consisted of M. Firas Al Farisi as Committee Leader, Sari Wahyuni as Secretary, Jumiati as Treasurer; supported by another division consisting Jorge August as Program Coordinator, Andi Julian as Logistic Section Coordinator, Festy Trisya as Catering Section Coordinator, Rommy Subagya as ‘public relations and fund’, Agung Juniarto as Publication Section Coordinator, Vita Andini as Health Section Coordinator, Amin Rahman as Security Section Coordinator, and Heri Febriyanto as Field Coordinator. Being supported by a complete committee division, the program was able to be controlled thoroughly. ESC with missions to reinforce the threats of familiarity and to bring the Faculty of Teacher Training and Education towards a better tomorrow, held expectations of the participating students that they can apply what they got from the training into their daily lives. (MFAF).